Together we can make real, meaningful progress. Our deep experience in strategic, community-focused solutions, combined with our insight and straight-talk approach, is highly effective in creating clarity and momentum. We’re all working toward the same goal – making the world a better place. Ekstrom Alley Clontz & Associates’ seasoned collection of experts truly understand, through first-hand experience, the unique complexities of the community foundation environment. 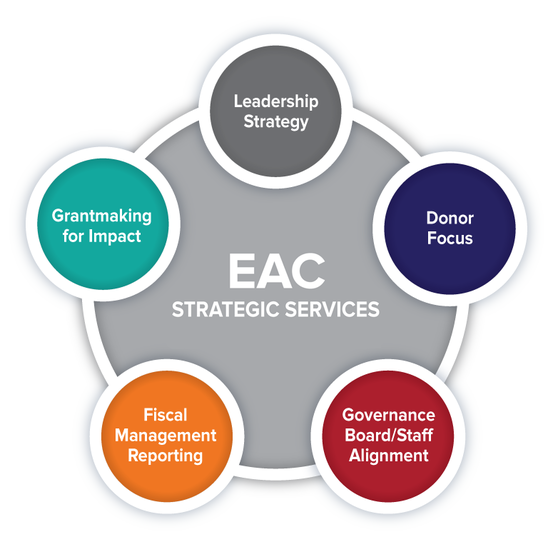 EAC's strategic services foster alignment and ignite effectiveness. Clients rely on us to bring clarity to complex organizational challenges. We provide exceptional counsel to community foundations of all sizes so they can operate more efficiently, more effectively, and with a broader perspective.